It’s very rare, but sometimes we check out a video that leaves us just about speechless. This is one of those times, but we’ll make a valiant effort to offer up some insight on what exactly is going down in this situation that screams science fiction. For some reason, this motorcycle rider decided that he didn’t want to ride anymore, but instead of returning his bike to its home, he had a whole different scheme in mind in which he would take his ride with him. 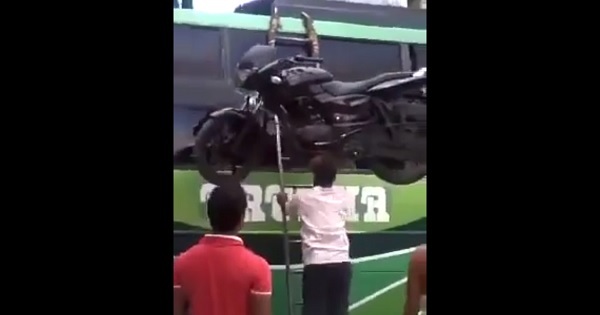 In an effort to ride the public bus with his motorcycle, he had to come up with a creative way to load the bike onto the bus to get it to wherever it was that he needed to go and instead of driving it up or using some sort of ramp system, this man would go on to load the bike on the bus using nothing but his head. We’re not sure about you, but we’ve personally never lifted a motorcycle up entirely off of the ground, let alone with our heads. Even the smallest of street bikes is generally too much for the average person to hoist, so this is just ludicrous. What do you think of this incredibly odd sequence of events. Jason Abalos' Alleged Video Scandal Leaked on Social Media! Miss Universe 2015 memes trending online !